Please refer to our stock # 1-1143 when inquiring. 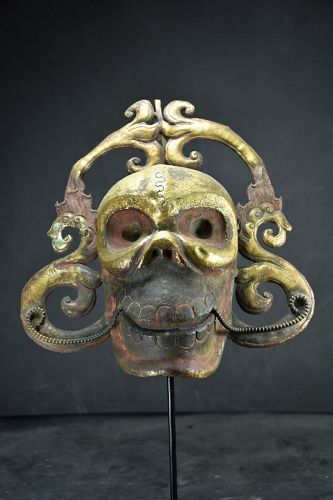 Elaborate mask of Citipati, made of embossed, gilt and painted, bronze. Partly encrusted reddish-green patina. Tibet, 18th century. The mask is nicely mounted on a custom stand. Height (without stand): 26 cm. Very good condition. A very rare piece. Gilt Bronze Citipati Head, Tibet, 19th Century Gilt Iron Dragon Plate, Tibet, 18th Century Rare Hindu Gilt Bronze and Coral Plate, Nepal, 17th C.